Beer and Spirits offers a fascinating insight into the stories behind some of Central England’s most haunted pubs. With over 50,000 public houses in the United Kingdom, the local pub has become an essential part of British culture. Samuel Pepys described the inn as the heart of England. Pubs have been an integral part of British culture since Roman times. The lives and dramas, intrigues and mysteries of the people who visited them form the rich tapestry of any local pub. As a result there are often many stories and histories that are inherently part of the place, and naturally ghost stories and haunted reputations form a dynamic feature of many local pubs. From spectral monks and phantom coaches, to ghostly highwaymen and supernatural hounds, the authors examine some well known and not so well known aspects of Black Country pub history and folklore. 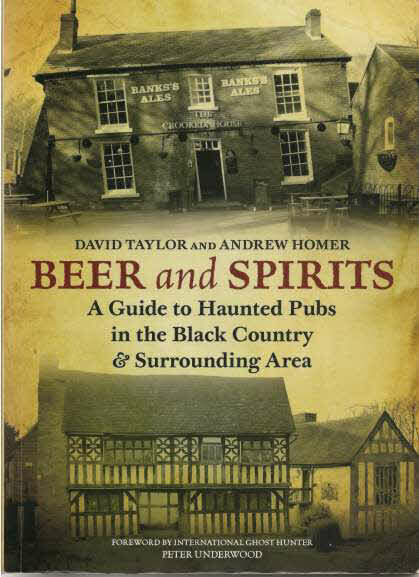 While the stories and accounts in this book are not meant to offer any proof or conclusive evidence of ghosts, they do offer a fresh look at new and more traditional accounts of haunted pubs in the Black Country and the surrounding area. New: Now also available as a Kindle eBook!